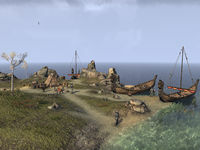 East-Rock Landing is an island off the east coast of Rivenspire, southeast of Northpoint. An orc named Stroda gra-Drom resides here. Kill the Orc, Stroda gra-Drom, at East-Rock Landing.